Sarah Outen MBE is a British adventurer who, aged just 28, became the first person to row solo from Japan to Alaska. It took 3,750 nautical miles, 150 days and one seven-metre boat, ‘Happy Socks’, to complete – and the best bit? She proposed to her girlfriend, Lucy, while she was out at sea, and the couple are now engaged. Sarah is currently three-quarters of the way through a colossal challenge entitled London2London: Via the World, in which she is cycling, kayaking and rowing her way east across entire oceans and continents – 25,000 miles in total. Right now, she’s biking through freezing Alaska (and still found the time to talk to us! ), to the East Coast of the USA, from where she’ll embark across the North Atlantic back to London on her final leg of the journey. Her starting point back in April 2011, Tower Bridge on the River Thames in London, will hopefully become her final destination when she completes her global loop sometime in summer 2015. Sarah is not only an inspiration to other women for her sheer physical determination, but also for the way she shares her stories. She supports several charities through her adventures, and gives her time generously to speak motivationally to both children and adults at events and live Q&As. Her positive attitude, intrepid spirit and fearlessness have also caught the attention of LGBT activists, and she was included as a new entry in the Independent on Sunday’s Pink List 2013, which recognises 101 gay, lesbian, bisexual and transgender people that make a positive difference today. The lesbian, gay and bisexual charity, Stonewall, also shortlisted her for its Sports Personality of the Year Award in 2013. Sarah’s Twitter page is worth a read in itself, as it’s full of positive quips about her travels, with her location judiciously set to ‘The World’. While following her journey, we were obviously very excited to be able to speak to Sarah for #InspirationalWomenWeek. Read our interview below. Hi, Sarah! Thank you so much for taking the time to speak to us. So how did you first get into rowing, cycling and other sports? I have always been outdoorsy and sporty with a range of interests and a love of the water. I started kayaking while a teenager, though didn’t do any between leaving school and this expedition. I started rowing when I was studying at Oxford and that’s where I heard about ocean rowing, inspiring me to focus on a future ocean row. Cycling has always been a part of my life, but the expedition cycling started with this expedition too. I have always acted on impulse and feeling – if I like the look of something then I have a go. I love being the engine on a journey. How did you first decide to start undertaking massive challenges, like rowing from Japan to Alaska? My first expeditions happened while I was at school through my canoe club and school programmes. 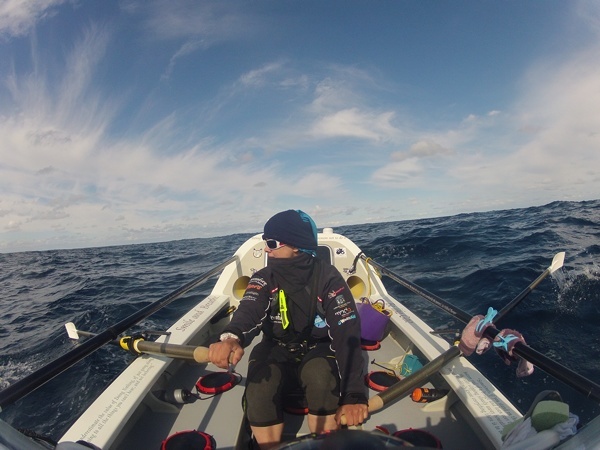 That opened my mind to the idea of bigger expeditions and when I heard about ocean rowing while I was at university I knew I would have a go one day. That first ocean row in 2009 led to this London2London:Via the World journey. It’s a love of being outside, exploring new places, meeting people and getting close to wildlife that drives me to make journeys – little or large. I am motivated by a love of doing what I do, making the most of life and of getting home safely and swiftly to my fiancee. On that note, who inspires you? Lots of people inspire me – both living and dead. My father died eight years ago and his life and ethos are huge for me, still. A couple of good friends, Kris and Maren Hallenga, started a charity called ‘CoppaFeel!’ after Kris was diagnosed with stage IV breast cancer aged 23. They inspire me. And people I meet on the road, daily. Like Ann whom I met today, a survivor of the ‘Residential Schooling’ programme in Canada where aboriginal children were taken away from their families to be ‘civilised’. The work she does now in supporting women in the territory and fighting for women’s rights is really inspiring. What technology do you rely on to communicate with family, friends and the outside world when you’re at sea or on a long trip (such as your current London2London challenge)? My Iridium satellite phones are lifelines. They act not just as telephone or text facility but also as a modem for sending emails and photos, from wherever I am in the world, land or sea. I can keep in touch with my family, team, sponsors and school children. I even asked my fiancee, Lucy, to marry me over the satellite phone last year! The other really important bits of kit are my McMurdo EPIRB and PLB units, used in case of emergency, and my YB tracking unit which provides real time tracking of my journey. What are your five must-have apps? Iridium Axcess Point, Google Maps, PhotoEditor, GoPro and Twitter. What’s the hardest thing about being away for such a long period of time? What do you miss the most? Being away for long periods of time is hard on families and friends. Since I got engaged it multiplied exponentially! That’s what I miss – family and friends. In your most recent blog post, you mention some of the interesting characters you’ve met in Canada. How do strangers react when you tell them what you’re doing? People are really supportive of my journey, right around the world. I have been met with such warmth and generosity, it is humbling. Some people often say ‘I could never do what you’re doing….’ I disagree. Right now I am just riding a bike! Would you say you had a ‘female perspective’ on sport? If so, what is it? I definitely do. I am a feminist through and through. It still saddens me that there is such a gap in provision of, and participation in, sport for and by girls and women at all levels. Media coverage and sponsorship of women’s sports is way behind the men too. It is frustrating but things are changing slowly. How do you cope with setbacks? I cope with setbacks by coping with them :-) Accepting there are things I cannot change and also working on things that I can, improving strategies where needed, and just being stubborn. I am really determined and believe we never gain much by giving up. Setbacks have made my journey all the richer and led to new stories and twists I could never have imagined. Its all about embracing change, rolling with it. It’s not always easy, but it’s a good goal to go with. Proudest achievement…. Two things. Firstly having a young Chinese guy cycle across China with me on a whim, two days after meeting me. He had never cylced more than a few miles before and didn’t have a bike. A month later we had pedalled nearly 2000 miles together. Secondly, it is getting out of the hole that I found myself in after the Pacific rescue of 2012. It took many months and a lot of help but I was on the brink of signing out of this world, so to come back from that feels pretty sweet. This life is to precious to leave too soon. What was it like to be featured on the Independent on Sunday’s Pink List 2013 and to be shortlisted for the Stonewall Awards? Is it important to you for your achievements to be recognised within the broader context of sexuality / gender? I am all for equality, whatever the context. I realise that now I am with Lucy, my fiancee, through my blog and expedition and talks I have a bit of a voice for rainbow rights and visibility, which all adds to the broader social issues of acceptance and equality. It feels like there is pace gathering on this front and it is exciting to be a part of it. Obviously I wish it wasn’t an issue and didn’t need to be a part of anything, but I am thankful for everyone who worked hard before us on these grounds. You’re also an author and motivational speaker. What advice do you find yourself giving most often? Do it. That’s the main bit of advice. Don’t get caught up worrying in stuff – just get out and do it, whatever your ‘it’ needs to be. And just be yourself. Be proud and unafraid to be yourself, following your path, wherever that might take you. And don’t give up of course, nowhere got anywhere by giving up. After you’ve completed London2London: via the World, do you have any more challenges up your sleeve? If not, what next? I will wrap the expedition with book writing and film making and tying up my sponsorship commitments and then I want to focus on helping young people get outside and have adventures. On a personal level it is the biggest adventure of my life – getting married! Click here to visit Sarah’s website and follow her progress.